Windows Server Container Docker Support in the Cloud is now Available! 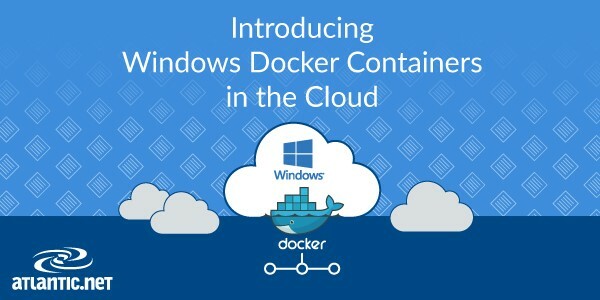 We are happy to announce the availability of Windows Containers with Docker. This enables Windows users to package applications into images that can be run on any Windows 2016 server. Users can now deploy and scale their Windows Containers across Atlantic.Net’s global Cloud. Atlantic.Net’s container support eliminates the “it works on my machine” problem once and for all. Ship dependencies along with your apps in Docker containers for portability and predictability during development, testing, and deployment. Additionally, isolating your apps in containers helps eliminate conflicts, enhance security, and makes it easy to scale your deployments as need. Windows Server 2016, the latest Windows Server offering from Microsoft, along with Windows Server 2012 and Windows Server 2008, are all available as Cloud Servers from Atlantic.Net. Windows Server 2016 is a solid solution for customers needing power and speed to run applications remotely. Atlantic.Net Cloud Server clients can test the new tools offered by the Windows 2016 operating system and pay via a usage model on a per-hour basis without having to incur additional licensing costs. Curious about how to get started deploying your first Windows Server 2016 with Containers + Docker? We’ve got your covered! Visit our Atlantic.Net Community page for our how-to article on Getting Started with Windows Containers and Docker. Deploy Windows Server Containers Today! Be among the first to try out the promising world of containers with no commitment, backed by our world-class support team that is 24/7/365. Atlantic.Net’s Windows Cloud Hosting plans start at only $0.0208 per hour (or $14 per month), with usage calculated on a per-hour basis.